ADV-2800EC - 8-channel MPEG-2 SD Encoder with built-in multiplexer | AdvancedDigital Inc. The ADV-2800EC is a reliable 8-channel high density MPEG-2 Encoder. Each of the channels can simultaneously support mpeg2 video encoding in standard definition. Each encoded channel can be combined with the ASI input and further multiplexed using the built-in mux. 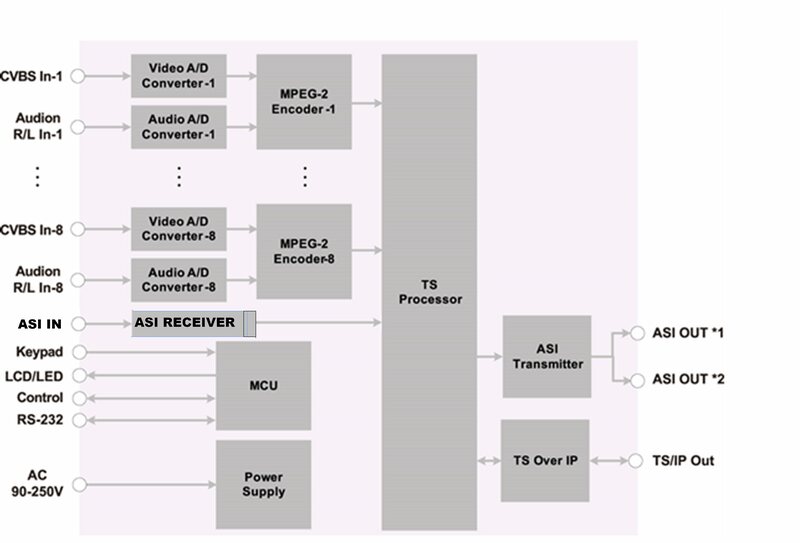 The final multiplex streams can be output to DVB-ASI as a trasnport stream (TS) or sent out to the Gigabit ethernet port for video streaming or storage applications. The ADV-2800EC is commonly used with legacy terrestrial broadcast networks such as DVB-C and ATSC. The ADV-2800EC is a hardware based encoder built for reliable 24×7 performance at a competitive cost.